The freeze is coming. Are you ready? One of the most powerful fears Americans experience is someone stealing their personal or financial identity. The Experian data breach affected 145 million people in the fall of 2017; that is 50% of our population. It is now our turn to take back control of this sensitive data. How? It is called a credit freeze and best of all, it’s now free to use. It is a program that allows you to restrict or eliminate access to your credit. When you limit access, it keeps the vast majority of individuals and companies from accessing your credit report and opening fraudulent accounts. It is also sometimes referred to as a security freeze. Why companies need access to your credit report? All types of companies use your credit score to analyze how much credit to give you and at what interest rate to charge for the loan or debt. Are credit card companies the only companies who access your credit report? No. Every time you apply for a loan, whether it be auto or home, the company issuing the loan will look over your credit report to determine whether they will offer the loan and at what interest rate. How long will my credit remain frozen? It will remain frozen until you apply a temporary lift. The temporary lift is can be for 24 hours or up to 30 days. After the lift is over, your credit will freeze again. You also have the option of permanently removing the freeze at any time. I froze my credit and they gave me a PIN number. Why is this number important? When you apply a credit freeze for the first time, the credit reporting agencies will give you a PIN number that will be used to temporarily or permanently lift your credit freeze. The number is extremely important. This number will differ from each of the agencies, so when you apply for a freeze make sure you have a pen and pad together so you can record this number for safekeeping. Wait. Occasionally I will need access to my credit report for personal reasons, right? Absolutely. A credit freeze does not keep you from opening a new account, renting an apartment, or buying a house. You will apply a temporary lift to your credit report, prior to the inquiry. During that temporary lift, those companies will have access to your credit to make the appropriate financial decision. A credit freeze also has no impact on your credit score. Can anyone access my credit under a credit freeze? Certain entities, such as creditors or debt collectors acting on their behalf, will have access to your credit under a freeze. Additionally, government agencies in response to a court or administrative order, subpoena, or search warrant will have access. 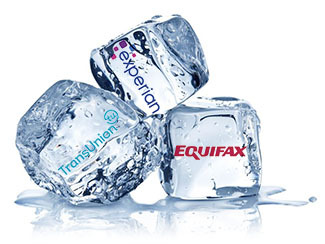 Previously, credit reporting agencies charged a nominal fee to freeze your credit. The new law will make freezing your credit completely FREE. The new law allows parents or guardians of children under 16 to freeze a child’s credit file. If a child doesn’t have a credit file — which is often the case — the law directs the bureaus to create one, and then freeze it. The new law requires the three major credit reporting agencies to create a distinct webpage designated for credit freezes. The Federal Trade Commission will post links on identitytheft.gov. Still confused about the process? So, what are you waiting on? Grab your parka and pour a hot cup of joe; the freeze is coming!